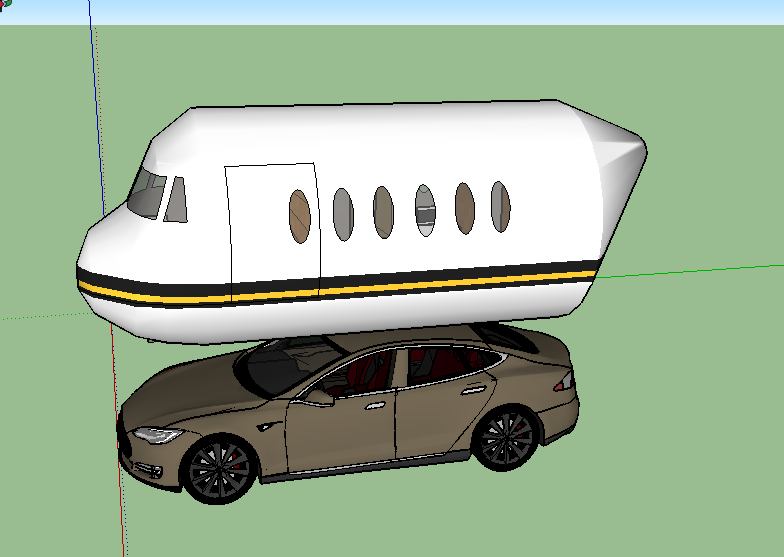 Hey All, I'm attempting to design a rigid rooftop camper tent that will be permanently mounted to the roof of a Tesla Model S. This is going to be an around 7-foot diameter tube (I want it to be standing height inside) and 20 feet long so there's no overhang on the sides and about a foot and a half of overhang at the front and rear of the vehicle. I'm making it out of carbon fiber and nomex honeycomb, I did the math and it'll come in around 300 pounds which is very light for such a huge structure. The Tesla has about the lowest center of gravity of any production car and I don't drive over 45mph so I'm not worried about crosswinds. 2) how much of a gap I should have between the floor of the camper and the roof of the car. If there's little gap, I'm worried the frontal area will act like a scoop and totally mess up the aerodynamics of both. The Tesla is 4.7 feet high and I would need to keep everything under 13.5 feet to be street legal. I tried modeling everything in "Autodesk Flow Design" which is a 3D wind tunnel simulator but I'm not convinced it is giving me Cd values that are anywhere near accurate. Uh....um....Is there any particular reason you wouldn't figure out a way to make a trailer out of this and pull it behind the car? I have no idea about the rooftop venture you propose, I don't believe it has been attempted. Thanks for posting the pic. The reason I want it on top is that it makes finding parking a thousand times easier, keeps it away from dirt and insects, and the Tesla's air suspension will "auto-level" the car when parked, therefore also leveling the camper. It also doesn't have to be licensed like a trailer. So most of the same reasons that rooftop campers are gaining popularity in general. I know that is terrible for aerodynamics versus just towing it, but I live in an apartment with street parking, so if I want to go camping on the weekends and still have a place to park during my weekday commute, roof-mounted seems like the only way to go. Might be some adverse behavior in windy conditions. Consider bridge clearances can be as low as 13.5 feet. I would make a trailer and look for a rental storage bay. A canoe and a good tent would be easier. Last edited by Grant-53; 11-04-2016 at 09:34 PM..
Definitely paint it yellow and brown and put "Oscar Meyer" on the side. Also note the wiener is the perfect piercing shape. Much like a nuclear sub full of seamen in an emergency blow, or the famed No-Dong missile of North Korea entering a black hole. Forget these modern aerodynamic software programs, the wiener has been getting it done for a million years. Have you considered a collapsible design something like roof top tents but with hard sides? No need to make it completely rigid all the time while traveling. Do you really have to have standing room while on top of the car? Consider the limitations you would have when driving through low clearance areas. Last edited by BamZipPow; 11-05-2016 at 12:51 AM.. Even parked, the Tesla will likely not have enough weight to keep that contraption stable in windy conditions. I saw a guy lose a large toolbox he was using to weigh down a large cardboard box. A gust of wind lifted them out of the pickup bed. Why not an actual tent that can be thrown in the back seat or trunk? Even a big cabin tent packs up small enough to fit easily in most trunks. Where do you go camping at 45 mph in an electric car that doesn't have a cheap motel nearby? Have you considered a single wheel trailer and a Wacky Shack?